Working in a steel yard, I and the other workers were bedeviled by what we assumed were droppings from an insect or spider. The ghostly white hairy oblongs were everywhere around the outdoor stacks where we kept our steel channel, tubing, and other raw materials. We would also find them in the stacks of pallets we shipped finished goods on. When we tried cleaning them up, more would appear the next morning. It was only when we worked late into the night beneath a full moon to meet an order that we realized what these droppings were. Periodically, we’d see an owl silhouetted against the moon as it flew away–with the naked tail of its prey hanging from its talons. We realized that the mysterious droppings were owl pellets and that we needed warehouse pest control to bring the population of rats down so that the owls would hunt somewhere else. Chew Marks: Rats and mice are constantly chewing. Shredded cardboard and gnawed wood or wiring can be signs of rodents in your warehouse. Cockroaches are also known to chew on cardboard or paper, leaving patterns of holes through the layers. Musky Odor: Often, infestation of a building is accompanied by a musty or musky odor. An unusual odor in a warehouse should always be investigated to determine the cause. Tracks: One of the signs of rodents in the warehouse is visible grease tracks, especially in places where it would be difficult for a person or equipment to make a mark. Tracks around roof joists, vents, or pipes are a sure sign of rodents. Droppings: Rodents and roaches both leave behind droppings in the form of small dark grains. These droppings can potentially spread bacteria and viruses and are not only a hazard to your products, but also to your workers. Discovering any of these signs of pests in your warehouse should prompt a quick call to the exterminator. However, while rodents and roaches are well-known pests and easy to identify, other types of pest are relatively unique to warehouses and can go unreported for a long time. Common Beetles: When an employee discovers a small brown or black beetle that clearly isn’t a roach, it may not trigger any alarm bells. However, cigarette beetles, drugstore beetles, flour beetles, and the appropriately named warehouse beetle can all infest dry foods like nuts, flour, barley, cereal, and pet food, if left unchecked. Spider Beetles: Spider beetles are hardy scavengers that feed not only on human foods, but also on the feces of other pests, meaning that they can pick up E. coli, Listeria, and other bacteria, and track them into human food. They get their name from their distinctive round body and long legs, and they can be confused with a small spider, which means they may not be recognized as a pest. Rice, Bean, Granary, and Maize Weevils: Weevils are small beetles that eat a variety of crops and lay their eggs in the seed, making them an agricultural pest. They can be recognized by their distinctive snout-like head shape. While they’re harmless to humans and can be eaten without harm, consumers are unlikely to be happy if they discover weevils in their pantry. 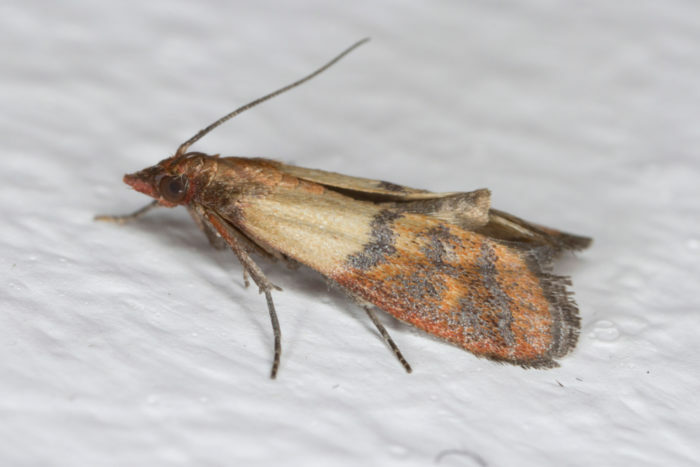 Indianmeal Moths: A two-tone, dark brown insect, the Indianmeal moth is one of the most common stored-food pests in the world. The larval form does all of the damage and attacks pet food, bread, pasta, flour, seeds, and other foods. It can also chew through packaging to get at the food. Since none of these common warehouse pests are instantly recognizable to the average warehouse worker, they are often able to establish themselves in a warehouse without anyone catching on until the infestation becomes a serious problem. Once they have become established, the best choice is to contact a professional extermination service. Bringing in a warehouse pest control service is a time-consuming and often expensive interruption to your warehouse operations. It’s also an expense that is likely to follow on the heels of consumer complaints, load rejections, and even costly recalls of contaminated goods. Clearly, the best option is to keep pests out of your warehouse to begin with. Ensuring that the roof is tightly sealed and leak-proof, doors close fully and tightly, and that any windows are also well sealed. Doing routine maintenance of plumbing and air conditioning to prevent leaks, which keeps pests from having a convenient supply of water to drink if they do make it into the warehouse and making it more difficult for them to breed. Cleaning your warehouse of any spilled food products and keeping tight control over employee food waste by allowing food only in designated areas and ensuring that trash is removed from these areas after each meal. These basic procedures are all part of keeping a warehouse clean. And while they will help keep pests from entering the warehouse, they won’t close off a warehouse’s biggest vulnerability: shipments of product constantly entering the building. If a pallet full of packaged foods arrives, bringing the pests along with their food supply, then they will have the means to establish themselves in the warehouse in spite of all efforts to keep them out. Plastic shipping pallets have far fewer crevices that insects can use to conceal themselves than wood pallets do. Plastic pallets can help prevent pests from using this route into your warehouse. Plastic shipping pallets have far fewer crevices that insects can use to conceal themselves than wood pallets, and unlike wood, they’re not a satisfying chew toy for rodents. Plastic is also nonabsorbent, and a plastic pallet is less likely to give pests a source of water that they can use to survive. Finally, it’s possible to wash and sanitize plastic pallets, which makes it much easier to control pests. 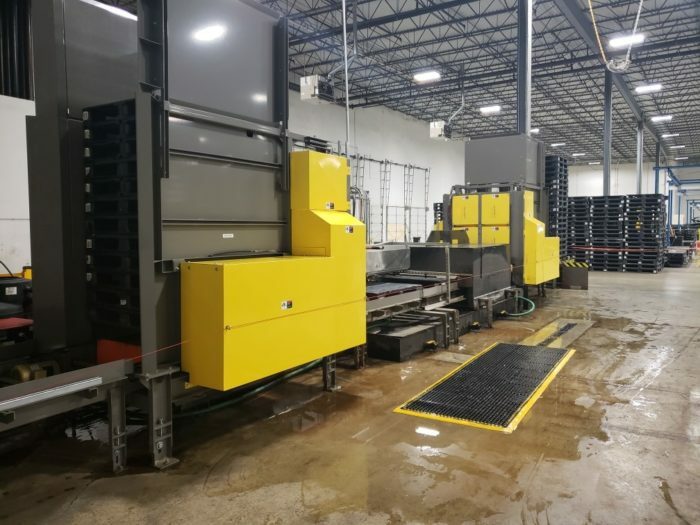 All of these features give plastic pallets a clear advantage in preventing the transfer of pests between warehouses, saving your business money on extermination fees and wasted product, and, ultimately, on your Total Cost of Business (TCOB). The iGPS pallet pool offers a reusable plastic rental pallet that is washable and sanitizable. To get the rented plastic pallet that reduces pest contamination in the supply chain, give our team a call at 1-800-884-0225, email a specialist at switch@igps.net, or visit our contact page.